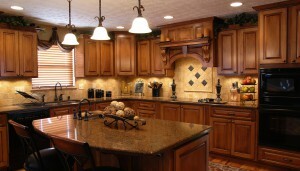 Working on a kitchen & bathroom remodeling project can be both exciting and daunting. After all, you’re getting to customize your own home to fit your exact style, but making so many decisions can become a huge burden on your shoulders. To help ease the load, here are some great ideas that make for wonderful qualities in a new kitchen or bathroom design. Such upgrades can be essential for sprucing up your space and adding value to your home in the meantime. To start, when you’re laying out the design for your new kitchen, it’s crucial that you make a wise choice when considering your countertop options. After all, the kitchen is generally the hub of the home and how it’s remodeled can either bring happiness to you and your family or it can put a damper on the mood every time you walk into the room. Thankfully, there are myriad styles of kitchen countertops to choose from these days including granite, soapstone, concrete, tile or quartz. Even woodblock countertops have become all the rage, introducing a more rustic, comfortable appeal in the kitchen space. Next, it’s important to note your options for your kitchen floor, as well. A kitchen & bathroom remodeling project just isn’t complete without a proper, modern floor upgrade. It’s vital that you incorporate a material that’s durable as well as stylish, such as natural stone tiles or shiny hardwoods, to ensure the floor can hold up through busy day-to-day traffic. Finally, a bathroom remodel needs a grand focal point and a well-designed vanity can be just the right accent piece. Countertops can be an important feature in your bathroom, too, as well as modern sink arrangements and mirror decor. The vanity becomes a well-used space, so picking one that’s attractive but that also provides plenty of storage is key. If you’re looking to make a bold statement with your kitchen & bathroom remodeling project, following these ideas can lead you to a greater overall concept for your living space.